Last week America got to know Murrieta, California - and it was not pretty. On Tuesday, jeering crowds of anti-immigrant protestors succeeded in turning back Department of Homeland Security (DHS) buses carrying undocumented women and children from Central America. The protestors put an ugly face on the anti-illegal immigration movement with their chants of "Go home!' and "We don't want you!" Amid a storm of national news coverage, Murrieta's city manager acknowledged that the protests were a "black eye" for the city. That's an understatement. These protests were disgraceful, unfortunate, and unnecessary. They did not contribute anything constructive to our immigration debate. Not only did the protests stain Murrieta's reputation, they may result in troublesome ramifications for conservative political leaders as well. Asked about the protestors, Murrieta Mayor Alan Long said, "As far as exercising their constitutional rights, I'm proud of that." But all constitutional rights, including freedom of speech, come with limits. The Murrieta protestors had a right to their views, and to peacefully express them. They did not have the right to spit on people, or to block DHS buses. Mayor Long bears responsibility for his police officers standing by and not arresting protestors (Pro-immigration reform activists frequently engage in civil disobedience, protests, and sit-ins too, and they are just as frequently arrested). There is a perverse irony to the Murrieta protests, given that the rallying cry for the anti-illegal immigration movement is "What part of illegal don't you understand?" By blocking the buses, the protestors were engaged in the illegal act of interfering with law enforcement. In fact, interfering with federal law enforcement actions, such as DHS activity, is a serious offense. And in turning the buses back, the protestors just delayed the deportations of the undocumented immigrants they were carrying. Although the Murrieta protestors were upset about illegal immigration, that doesn't fully explain their rage. For now, their side has won the immigration debate. Comprehensive reform is dead in Congress and will not be happening anytime soon. President Obama has sent Congress a letter, asking that the child migrants be sent home as soon as possible. So there is no logical explanation for such an outpouring of hate unless we consider that racism and xenophobia are likely part of the equation. Only then do the protests begin to make sense. How sad that the Murrieta protests occurred on the same week as the Fourth of July. As Janet Murguia, President of the National Council of La Raza wrote in The Huffington Post, "There is nothing more un-American than showing not even one shred of sympathy, compassion, or even decency towards a group of desperate young children who showed up on our doorstep after having spent weeks on a treacherous journey." Now where is the outrage from prominent Latino lawmakers, like Sen. Marco Rubio (R-Fla.) and Sen. Ted Cruz (R-Texas)? They have a moral obligation to denounce the Murrieta protests as unacceptable. By not speaking out, Republicans run the risk of further cementing the image of the GOP as anti-immigrant and anti-Latino. Mayor Long insisted in an open letter to President Obama that, "Ours is a very compassionate and caring community!" He may be right, as we do not know how many of the protestors were actually from Murrieta. Still, today most Americans probably only know of Murrieta as a symbol of hate, and that's a shame. Consider the experiences of other cities that have also received child migrants for processing. Jim Darling, the mayor of McAllen, Texas, said recently that his town is treating the undocumented immigrants in his city "the same as we treat all our visitors - with dignity and humanity, with open hearts and a helping hand." In Dallas, offers have poured in to help child migrants from individuals, churches, and charitable groups. These responses to a humanitarian crisis are far more reflective of who we are as a country than the spectacle of bigotry in California. 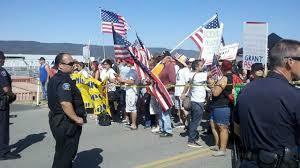 The Murrieta protests were a shameful, sickening display of anti-immigrant sentiment. Such vigilante behavior and vitriol are out of sync with American values, and have no place in a civil society.